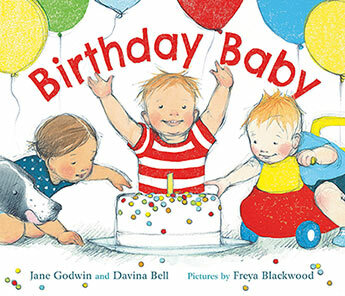 To celebrate publication, we caught up with the terrific trio of picture book creators Davina Bell, Jane Godwin and Freya Blackwood about their latest offering, the delightful Birthday Baby, which perfectly captures and celebrates a baby’s birthday party! This title celebrates the joys, triumphs and tragedies of a first birthday party. This milestone is becoming ever more celebrated in our culture as modern parents feel the need for champagne and a pat on the back for surviving their first year of parenthood. While the text is minimal, the subtext explores themes of community, family, friendship, the passing and marking of time, and the importance of ritual. Birthday Baby follows a group of children from extreme excitement to inevitable cranky breakdown, and in following this journey, young readers will find themselves and their own emotional landscape within Freya’s gorgeous illustrations, which capture the sweetness, humour and pathos of the baby’s world. I wrote this book with my friend and fellow author, Jane Godwin. Jane and I share a love of – and fascination with! – babies. I think that’s one of the reasons we’re such good friends. We are often sending each other text-message photos of cute and funny and interesting babies we meet, and remembering cute babies we have seen on our travels around the country as authors. While I don’t have children myself, my friends are all at the age where they are having children, so I am attending a lot of first birthdays. Seeing so many babies all together, each so full of expression and personality, each so beautifully dressed, was definitely an inspiration for this book. The essence of the book is the many personalities and moods of babies, and the fact that a baby’s mood or emotional state can change in a matter of seconds! The story is intended to capture all the funny and intense moments that babies go through in the drama of their daily lives. Babies love looking at other babies, and we wanted a book where the baby ‘reader’ would delight in recognising and exploring all the situations and reactions of the babies in the book. Our aim was to have a book where each baby was demonstrating a very recognisable emotion or personality trait so that other young readers could recognise these and it would be helpful in the recognition of mood in others. It would be a great book to give to a baby on their first birthday, a first book of empathy! We had previously collaborated with Freya Blackwood on another picture book, Hattie Helps Out. Something about Freya’s work perfectly captures the essence of childhood, and we thought that she would be able to beautifully convey the emotions and expressions of the babies in this story. Being a book for very young children, the illustrations for Birthday Baby needed to be bright. I felt the best way to achieve this was to use oil paints for the babies’ clothing. Rather than just painting the babies’ clothes straight on them, I tried to get some texture into the illustrations by using little lino blocks for each outfit. This meant a fair amount of lino block cutting, and sore hands, but the authors of the book, Jane and Davina, happened to be visiting us in Orange one day, so I put them to work with lino tools, and we soon got through the bulk of the work. I then printed each little garment for each page, using a fast-drying oil paint. These prints were scanned separately from the pencil and watercolour drawings of the babies and backgrounds, and the whole lot were composited digitially. It was a great little experiment and I think the final result looks lively and bright. Today I’m just playing with paper dolls. Working out how to get the brightest colours. It’s been a lengthy process to dress these babies, but along the way I have learnt to use the computer as a glue stick! Jane and I visited Freya right when she was in the middle of doing the illustrations for the book. She was using a brand new (for her) technique called lino cutting, which is like making little stamps that you dip in ink and press onto the paper. She was using these for the babies’ clothes instead of painting or colouring them. We all sat out together in the sunshine at her table and cut out the little stamps from blocks of rubber. Around us, her greyhound and rabbit wandered through the garden as we chatted about being children’s book creators. It is one of the happiest working memories of my author life. Or that should be, Happy birthday Birthday Baby book! 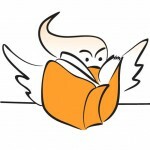 For those interested in creating books for children, Jane Godwin & Davina Bell are our tutors for the Faber Writing Academy course Getting Published as a Writer for Children in Sydney on September 8 and Melbourne on September 15. This one day course will help answer questions about what publishers are looking for, how to polish and submit work and much more.